[Caltrans] – The California Department of Transportation informs motorists and residents near the communities of Lebec, Frazier Park and Gorman that construction of the Rehabilitation Project on southbound Interstate-5 (I-5) will continue through the Memorial Day and Fourth of July holidays. Caltrans is currently working to improve the condition of pavement on southbound I-5 in Kern County from the Kern/Los Angeles County Line to 0.1 mile north of the Grapevine Creek Bridge near Lebec. 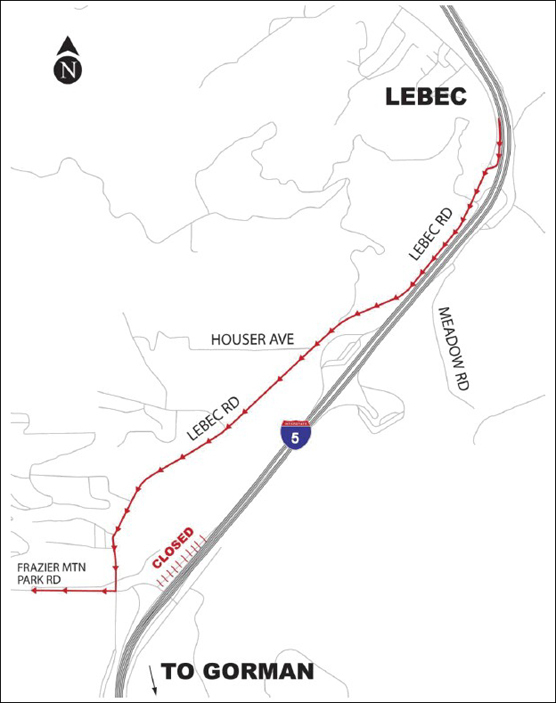 In order to provide the necessary protection for construction crews and the travelling public, traffic on southbound I-5 has been split and reduced to three (3) lanes in the area of Lebec/Frazier Park and commute/holiday travel may become congested. The #3-lane on southbound I-5 from the Lebec Service Road Overcrossing to the Frazier Mountain Park Road Overcrossing has been closed by placing temporary Concrete K-Rail on both sides of the lane. This safety railing will remain in place throughout this phase of construction. Additional closures of lane #4 will occur nightly, Monday-Friday, from 6 p.m. to 8 a.m. along this section of freeway. Long-term lane closures are necessary 24 hours a day, 7 days a week during this phase of construction, which is expected to be completed by mid-July. Commuters will experience delays and are encouraged to use alternate routes whenever possible. The southbound I-5 off-ramp to Frazier Mountain Park Road will be closed nightly Monday-Friday, from 6 p.m. to 8 a.m. until mid-July, 2012. Southbound commuters/residents must use the Lebec Road off-ramp to access Frazier Mountain Park Road during closures. The northbound I-5 offramp to Frazier Mountain Park Road will remain open during this phase of construction. Caltrans would like to thank the motoring public for their patience during this construction project. Motorists are reminded to watch for construction personnel and equipment. Please “Slow for the Cone Zone” at all times.